Michael Riven has fallen off a mountain. 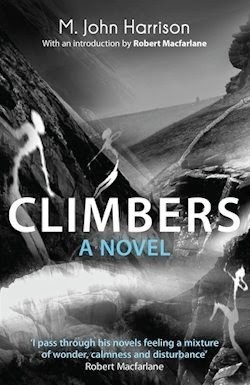 The author is broken in both body and mind, as the fall also claimed his wife and climbing partner Jenny. Readers are desperate to know what will happen next in the fantasy world Minginish, but neither writing, nor living, are of interest to the author as he lies in traction. But there are others seeking the scribe out. Men—and someone who is not all human—have begun a quest to rescue their blighted homeland, and their road will take them between worlds. 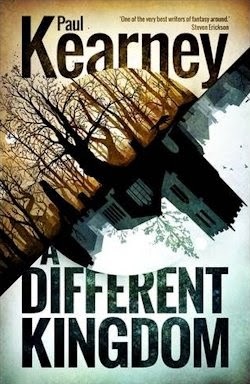 Michael Riven will return to his home in Scotland, and accompany a stranger into a place altogether more familiar and terrifying: Minginish itself, a real place stranger even than the world of his novels. Michael must take up the companions of his stories—Bicker, Ratagan and Murtach—and find a way to mend the sundered world. He may even find that Jenny's existence did not end that day on the mountain. 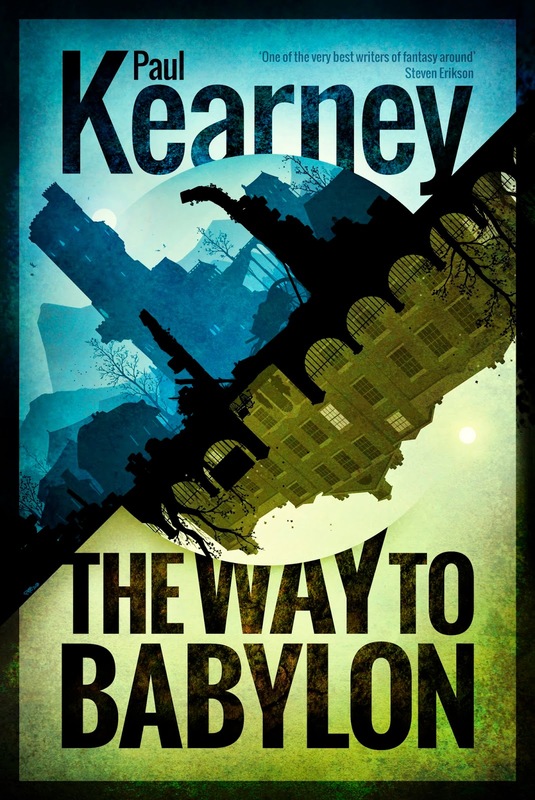 The year of Paul Kearney continues with a reissue of the underrated author's second novel, and if The Way to Babylon can't quite hit the highs of his astounding debut, its expansive narrative nevertheless fondly recalls some of the finest in fantasy. In the beginning, Michael Riven—the author of a successful fantasy saga himself—is miserable. Months after a tragic climbing accident, we find him broken in body and soul, and not a little bitter. Slowly but surely, he's coming into his own in a home, however he'll never be whole again, as the aforementioned catastrophe also claimed the love of his life: a ravishing lass from the Isle of Skye. Fans are apparently clamouring for the conclusion of his unfinished trilogy, but our man's imagination is a mess at the moment. Indeed, he decides it's unlikely he'll ever return to writing. "There was something there, something black and futile, which stopped him every time his pen touched paper." Something... or someone. See, "Jenny was in that world also, in every word he had ever written, as surely as if her picture smiled behind every sentence," and Riven isn't yet ready to be reminded. Instead, when he has most of his mobility back, he heads home, alone, to a broken-down bothy "where the mountains meet the sea." He's hardly settled in when a stranger appears in his porch; a rambler by the name of Bicker who invites Riven into the wilderness with him. Riven can't resist, particularly given that Bicker's destination is Sgurr Dearg—the same sheer slope he and Jenny fell from. But his travelling companion has other plans. He leads an unwitting Riven through a portal into another plane that proves particularly familiar to our author. Incredibly, he seems to have stepped into the fantasy kingdom of his fiction—and that's when he realises who Bicker is. "It was mad—crazy and insane. He was treading a non-existent world with a character from one of his own books." By all accounts his situation beggars belief, but Riven's incredulity can hardly withstand the real injuries he receives when a huge hound made of wood and wickedness attacks the party awaiting him and Bicker on the road to Ralath Rorim. It becomes clear that Bicker believes Minginish is finished... unless Riven can come up with a way to save the day. What follows is "a long story, spanning two worlds and riddled with the inexplicable," but of course "there's more to it than that." Too much more, to tell to truth. Though The Way to Babylon begins in the nursing home where Riven is recovering, this is but the first of a few false starts. A second is promised in the bothy; a third in Minginish; but the story only really gets going after a prolonged pause in Ralath Rorim. The Way to Babylon's second half is leaps and bounds better than its flailing first, in large part because we're almost helplessly propelled through this section as opposed to the previous puttering. Thankfully, the setting is never less than superlative; reason enough to keep reading even at the story's slowest. I'm probably a bit biased, having holidayed on them since I was a sprog, but the Western Isles off the coast of Scotland are one of my world's wonders, and Kearney does a cracking up job of nailing the way beauty and brutality go hand in hand on the Isle of Skye and its fantastical equivalent, Minginish. On the one hand, "the world was wide and fair, hung over with a haze of sunlight and shimmering with warmth." But this "green and pleasant place, wrinkled with silver rivers" also takes in "great ragged masses of stone rearing up to the sky in twisting ridges and peaked, veined with snow, bare as gravestones." It's a genuine pleasure to see these special spots rendered so remarkably. As are Kearney's characters. Riven's redemptive arc is inordinately rewarding; Bicker and his beery bodyguards—a blessedly bawdy bunch—keep things lively in the low moments; and Jinneth, a character Riven based on his late ladyfriend, presents a painful problem for our author to solve. A Different Kingdom's untraditional structure was one of its strengths, in that its frame felt fitting. Here, however, it's a hindrance... but The Way to Babylon is well worth reading regardless of the fact that it puts its worst foot forward. 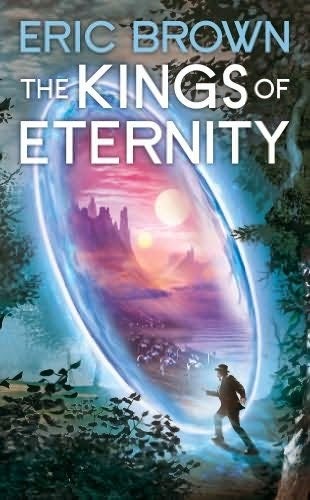 Its setting is simply superb; its central characters are a class apart; and once Paul Kearney is done manhandling his narrative, the immersive quest we're left with is winning as well.